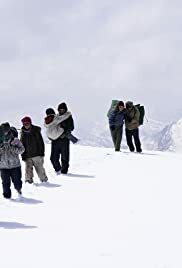 The film begins with a father and daughter having a very difficult journey travelling in mountain terrain in the snow for a better future, similar to the famous Turkish film YOL. The two are Tibetans escaping the Chinese who are stealing their land. The next scene shows a young lady in South Delhi, India, celebrating her birthday, attending dance classes and working in a beauty parlour. It is then revealed that this lady is the young girl that was traveling with her father in the snow at the beginning of the film. Through multiple flashback the journey is shown turning sour. But the lady escapes to India while the father is killed thanks to their local guide abandoning them. In South Delhi, a chance encounter brings the lady to meet the same guide now claiming to be a Tibetan rights activist. She intends to expose him. A staring flaw in the film is the fact that very few Indians are shown in a film supposedly set in Delhi. But the film is well paced and an absorbing watch.